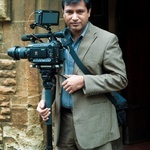 My name is Jai and I'm a professional videographer and editor with over eight years of experience. I'm a creative and passionate film-maker and have extensive knowledge...Read moreMy name is Jai and I'm a professional videographer and editor with over eight years of experience. I'm a creative and passionate film-maker and have extensive knowledge across a variety of filming styles and genres. Whether you're looking for a promotional film, conference film, showcasing an event or wedding film I can deliver. My hourly rate is £35 for filming. Please get in touch with me, if you are looking for a complete project including filming and editing.